This updated Victorian home is located on a tree lined street in Corona Heights. The façade of the house retains the original Victorian era details. This 3 level home has decks on each level from which there are breathtaking views of the surrounding hills. The main level has a spacious living room with a decorative fireplace, a dining room and an open kitchen. The living room, hallway, and dining room have beautiful hardwood floors. There are two large bedrooms on the upper level. The lower level provides additional living or work space and plenty of storage. There are 3 full baths, one located on each level of the home. The home has great light and an open floor plan. There is a lovely south facing garden with a hot tub. The garden is very private and has the feeling of a tropical sanctuary. 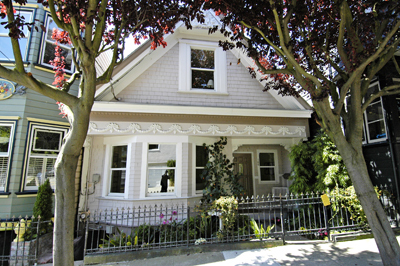 This home is just a short walk to the shops and restaurants of Castro Street.